Doug Morrell had already installed solar panels on his house in Coopersville, Mich., but he was eager to get a little bit greener. So the 52-year-old Navy veteran bought something that might seem more at home in the Dutch countryside than in a small town in western Michigan: a personal wind turbine. The 33-ft.-high (10 m) machine, whose blades span 7 ft. (2 m) in diameter, sits next to the pole barn 100 yd. (90 m) from Morrell's home. (Turbines like Morrell's convert the energy of the wind to electricity, while old windmills are geared for mechanical power, like pulling water from a well.) 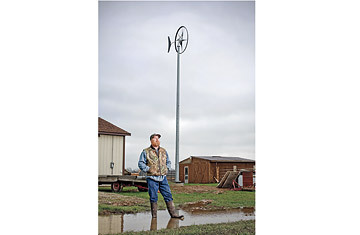 On days with decent wind  which occur frequently enough, since he can feel the breeze from Lake Michigan  the $16,000 Swift wind turbine can generate 1.5 kilowatts (kW) an hour, i.e., enough to power the average lightbulb for 15 hours. Together with his solar array, that's enough to take care of much of his electricity bill. "It's clean energy we don't have to dig for. It just comes right to us," says Morrell. And best of all, he says, "it's fun watching our meter run backward instead of forward." Thanks in part to a new tax credit put into place by Congress in October, owning your own wind turbine could be the next green trend. While it's true that wind power has taken off in the U.S.  adding more in new capacity to the electrical grid last year than any other power source  most of that increase comes from utility wind farms, vast fields of turbines more than 300 ft. (90 m) tall. For homeowners seeking renewable-energy sources, however, better-known solar power has always dominated. Home solar power currently generates 12 times as much energy as small wind power, which is defined as turbines that have a capacity of 100 kW or less (though most household turbines will produce 10 kW at most). That's partly because residential wind turbines require space and sky  at least half an acre of open land  to get access to consistent winds. Still, according to the American Wind Energy Association (AWEA), some 15 million homes in the U.S. fit that definition  and small turbines, unlike large wind farms, can be productive in weaker breezes, which puts more of the country into play, though the best areas are still windy spots like the Midwest or West Texas. What's really held back residential wind power has been the lack of federal subsidies, which have fed the growth of other renewables like solar and large-scale wind. "We've had zero federal assistance," says Ron Stimmel, AWEA's small-wind expert. But when Congress passed the bailout bill this fall, it added a 30% tax credit for small-wind projects, which Stimmel believes will enable the industry to grow 40% next year, even in a down market. In other words, small wind may not be small potatoes for much longer. And that could be a boost for domestic green businesses as well: U.S. firms control 98% of the small-wind market, in contrast to large-scale wind and solar, in which foreign manufacturers dominate. "Since the tax credit, our phone has been ringing off the hook," says Andy Kruse, a co-founder of Southwest Windpower, a major small-scale-turbine producer in Flagstaff, Ariz. "It's really exciting to see the market coming to us."